The black bands worn on badges in memory of slain police, sheriffs deputies and firefighters are sadly ubiquitous these days. The mourning bands, as they’re generically known, are in evidence this month in honor of Long Beach Fire Department Capt. David Rosa, who was killed by a gunman early Monday morning. 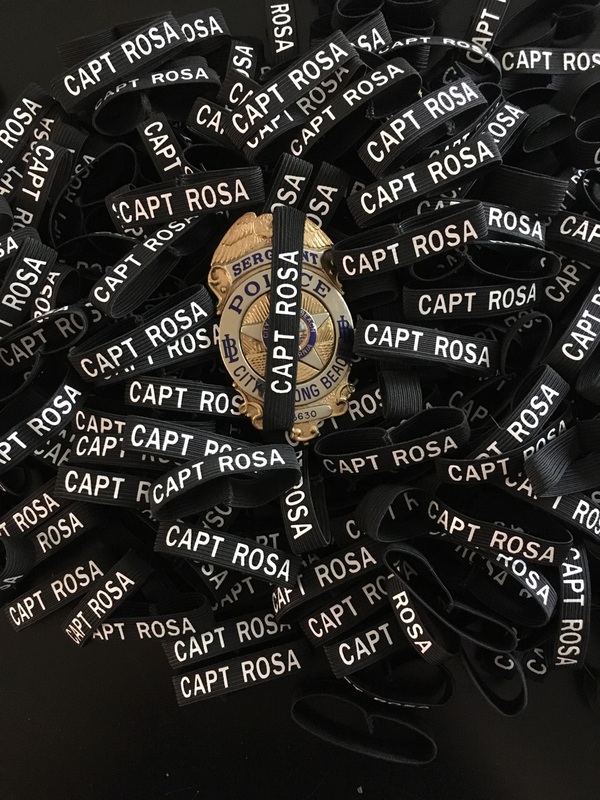 The bands memorializing Rosa were made in Long Beach by a nonprofit group, Honorbands, founded three years ago by two former Long Beach police officers, Julia Walling and Laura Tartaglione. Both women became busy shortly after the fire captain’s death was announced. Working 10-hour days, they produced 1,200 bands that day and another 1,500 on Tuesday. By now the black bands are on virtually every police officer’s and firefighter’s badge in Long Beach and beyond. The women don’t charge fire or police agencies for their products, and they don’t take salaries. They depend solely on donations. And they serve agencies far beyond their hometown: Alamogordo, New Mexico; Urbandale, Iowa; agencies from Fairbanks, Alaska to Orlando, Florida. More than 80 different agencies of police, sheriffs, Highway Patrol and firefighters and their various unions and supporters have made use of the services of Honorband. How did Honorbands corner the market on the product? L.A. County Sheriff Jim McDonnell is also planning on providing help from his county’s inmate sewing program. Local high-school students also pitch in on the bands’ production and, again, the students learn about the person for whom they’re making the bands. “They see the faces behind the band,” says Walling. The Honorbands are provided at no charge for each department that loses a member, but Walling and Tartaglione ask for a donation for additional bands that are given out to friends, relatives and other agencies. Donations, said Walling, have been slow. Businesses and unions, said Walling, prefer to donate to widows and orphans. Still, the Long Beach Police Officers Association, the Signal Hill Police Department and other agencies pitched in with donations for the Capt. Rosa bands. To donate, visit Honorbands donation page here.